Assistant Professor of Management and Business Law Dr. J. Haskell Murray, who teaches business law and dispute resolution courses in the Massey College of Business, recently received an acceptance of his article, “Adopting Stakeholder Advisory Boards,” by the prestigious American Business Law Journal (ABLJ). The ABLJ is a double-blind, peer-reviewed, flagship journal for the Academy of Legal Studies in Business with an acceptance rate of only three percent and is consistently regarded to be the top academic journal for legal scholars who teach in business schools. “Adopting Stakeholder Advisory Boards” proposes a novel corporate governance framework, which involves expanded stakeholder participation and power, for the emerging social enterprise legal forms. Professor Murray’s prior work has been used by at least five states in the drafting of their social enterprise statutes, and this current article hopes to have an impact on legislation, practice and legal scholarship. 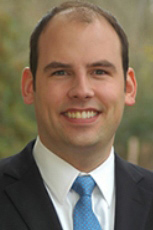 Murray joined the Massey College of Business faculty in 2013, having previously served as an attorney with Weil, Gotshal & Manges (New York City) and King & Spalding (Atlanta). He earned his J.D. from Georgia State University College of Law and also earned an Advanced Negotiation Certificate from the Harvard Negotiation Institute at the Harvard Law School.